Where you born before, during or after 356 production? And good luck with your Intermeccanica, and have fun. I know of you and your exploits in vintage racing. I head to Mosport and Watkins Glen each year for the vintage races, but will miss the Glen this month, sadly. We will also miss the Glen. Due to repaving at the track, they are racing the weekend after this; right after Road America, where we are right now. And they are using the short NASCAR course. Funny, but I have a very similar post to one in pg 10…. I have been blessed to live in California, that cornucopia of Porsche cars, in the USA, or World, for that matter. So many, and so rust free…. I joined the Reg in 1978 (remember those itty bitty 'Magazines' ???) and have loved every minute. When I think of all the savable cars that I saw get cut and crushed……the horror…. above…all Sold and long gone…. Came aboard in '45, when the concept was twinkling in The Doctor's eye. First Porsche was a '71 911T in need of paint, but a solid driver, several air and water cooled models since. Three Porsche in the stable currently, the '63 project is coming back as a beastie. Karisa and I were born in 1985! Born in '36. Raised in hot rod SoCal. First became interested in sports cars at races at Palm Springs airport in the 50s. Saw my first Austin-Healey when I was at RAF Station Brize Norton in '57. First Porsche was an early '57 A that we bought in '61. Had a new '64 356C, then a new '66 912. Now enjoying a '65 356C. Born 1944; 1st 356 (the black one) when I was 23 and a 2nd Lieutenant in the Army and about to go to flight school, then Vietnam. I was born in 1939 - Germany was busy invading Poland rather than building Porsches at the time. My first 356 was a 1959 Ruby Red 356A sunroof coupe that I bought in 1964 as a graduated student - working on a Ph.D. at the University of California-Davis. It had a blown engine and I got to repair it. It was totaled on a California freeway - rear-ended by a truck. I replaced it in 1967 with a 1963 356B coupe in Smyrna Green. I drove that to Iowa for a faculty job at the University of Iowa in 1968. The B was replaced by a 1964 C coupe - Ruby red again - in 1988. Lee and Neil did a total restoration of the car at Stalltek in Iowa - they had her for over 2 years. She came back to me like new. I call my C coupe "Ruby" and we have travelled the USA together. She's shown here with me in 2012 - at Stone City, Iowa - where Grant Wood did a lot of his painting. My wife and I winter in Scottsdale, Arizona and I drive Ruby back and forth from Iowa to Arizona ... and back and forth to all points east or west. I have 53 years of memories with Porsches - and my days on the roads in an A, in a B, and in a C are the high points. It has been a great ride so far .... made special by all the great 356 owners that I have met across the USA. I was born in 1946 and grew up surrounded by expensive sporting or British cars and the odd Citroen, so not surprisingly various MGs and more mundane cars were succeeded by a Healey 3000, E Type Jaguar, a few R-R & B before children and a measure of responsibility took over, so we had Saabs, Rovers and Citroen's, then back to more R-R & B, TR3A, Bristol 400 etc. My wife had a Healey 3000 we bought from John Chatham before we got married in 1970, I saw him seven years ago at a Classic car show where he was selling another and so I bought it. She was ill and wanted to visit her sister in France and I thought it might be good to do it in a Healey because she'd loved hers way back. In the event, she wasn't well enough to travel in it and my neighbour was selling her shopping car, so I bought that. It was a Boxster and a superb car in every respect apart from the bills. I still have the Healey, or more correctly I seem to have a Series 1 Land Rover and my son has the Healey, which I dont mind too much because he and his wife are enjoying it and more tolerant of the noise and water leaks. The Boxster made me curious and reminded me of an old Rolls-Royce engineer friend who used to bang on about 356s when they were new. So I looked hard because there aren't many in the UK where rust is quite a problem. I'm told there might be 7-800 and mine was a recent import. It's a learning curve and so far we've stripped all the paint off the underside and the inside, repaired as necessary and applied copious quantities of various rust inhibitors, retrimmed it, rebuild the steering box, had the gearbox and transmission done by the incredibly helpful PRS in Billericay and I've just overhauled the carburettors with good results. It's a lovely little car, it doesn't get the almost overwhelming attention that the Healey does, which is a relief, but it is admired by those who know, it's comfortable and drives well, is surprisingly fast for such and old lady, albeit sounding as though it needs three higher gears and its noisy, but I love it. Biggest problem is that all related events seem to be on the opposite side of London or in the States, but hopefully over time I'll meet up with other owners and be able to exchange horror stories. Born in 43 but a few hours earlier and it would have been 42 so instead of my birthday always being next year it could have always been last year. For some reason I thought I had already contributed to this thread but upon reading the posts I found I had not so here we are. 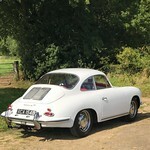 First 356 was in 1970, a very rusty 3556B but it was cheap when I traded in a Ford Anglia super I bought for 5 pounds and struck a deal for the Porsche at a local used car emporium. That was in Lyneham Wiltshire when I was in the RAF. Now I live in Kentucky with a collection I never realized I was making. I just like the cars and when they found me I let them stay. Now my wife tries to dissuade me from driving them because of their increasing value but they are still sub $30K cars in my mind just like I am mentally still 28 though some say 16 is closer in reality. My 63B is shown in my garage in Devizes England while I was trying to get it back to roadworthy condition. One of the very few pictures I have of it. It was sold in 1980 when I was divorced for the huge sum of 100 pounds. I often wonder where BMM935A ended up. Getting divorced for 100 pounds is a bargain!!! Just kidding David. That's a good looking fleet.